Ehem~ Well, basically this is the clip done by the bridal shop for us to play during our wedding day. Hehe! So might as well just upload and share it here since all the pictures are in this clip! Good idea huh? Few months after abandon this blog, now am back here for just a little quick updates. So, what happened within this few months? Main thing - relocated to Singapore. Yeap, thats right. 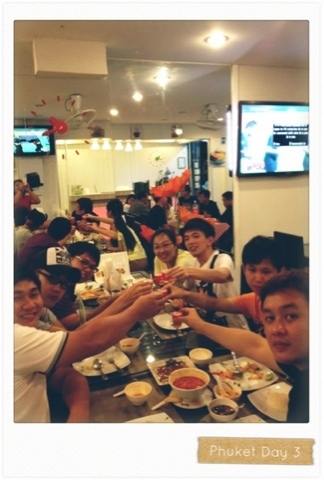 Left Finexsys for exactly 3 months now and really do miss the times back in Kuching. The working environment with own cubicle, listen to music while doing the work. Do thank GOD for having this lovable job as my first official job after graduate. So, now am here in Singapore for 2 months plus and still trying to adapt the fast pace environment here. Although life here is hectic but am still feeling blessed for having a lovable husband who always there for me. Ok. That's all for the updates. 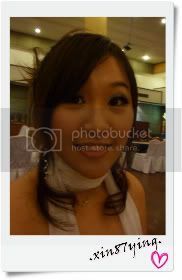 Will find some time to updates my long back dated wedding post and also Bangkok Trip post. Have a blessed day peeps! Me: Zzzz... My money not yet float ah! *This was supposed to be a scheduled post. But then just realised I did not published it but saved it instead. Oh well. It's the year again! Chinese New Year! This year will be my very first year celebrating without my parents, but with my Fan Su and family, and also first time celebrating it in Kuching. Just a very short update to wish all of you a Happy Chinese New Year! A totally cold and rainy weather recently! And it's really breezing cold in the office while it's cool elsewhere. Okay. 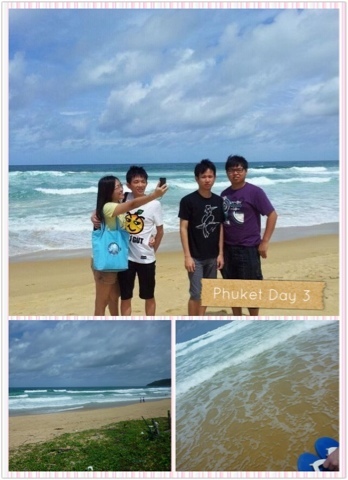 Back to my Phuket post. 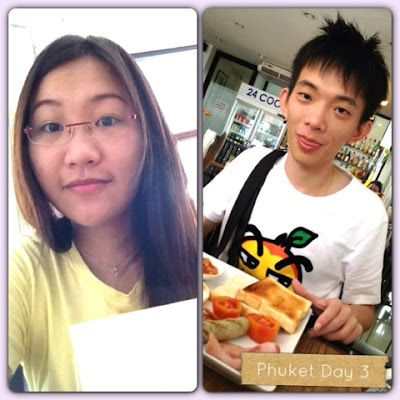 Today will be the last post where I'll be blogging about Day 3 and no Day 4. Main reason is just because Day 4 has nothing much to blog about; where we're just walking and wandering around the Patong Beach area while waiting for our transport to come in the afternoon. Haha! So, let's continue with my Phuket Trip Day Three - Day Tour in Phuket: where transportation + english speaking guide and schedule provided by Phuketpickup. Cost us THB1500 per person (RM150). Started our day by walking to the Patong Beach enjoying the wind while waiting for the others to be ready! Notice how strong were the waves and how blue was the sea. Nice blue sky too! 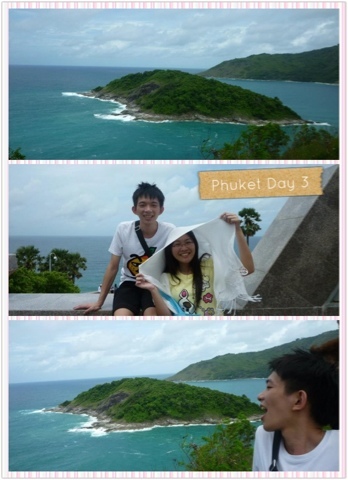 Then, our 2nd stop: Promthep Cape, the most famous sunset viewpoint in Phuket. Haha! But we reached way too early so there's no sunset to be seen. 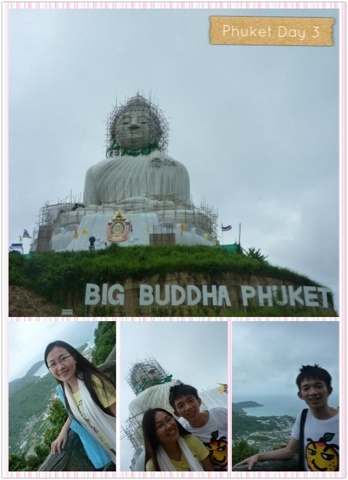 Next stop: Big Buddha Phuket, one of the most important and revered landmarks in Phuket. Over years already and it's still under construction cause most the construction fees were sponsored or donated. So, there's still an amount till it finish. Wat Chalong. The most important as it is the biggest and most ornate temple in Phuket. 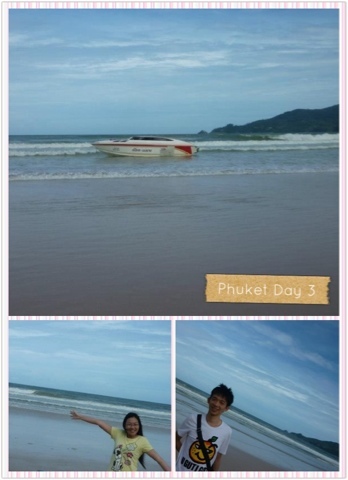 Spot our tourguide, Niyom in the bottom middle photo. He's a nice and friendly person. Then lunch at one of the local coffeeshop. 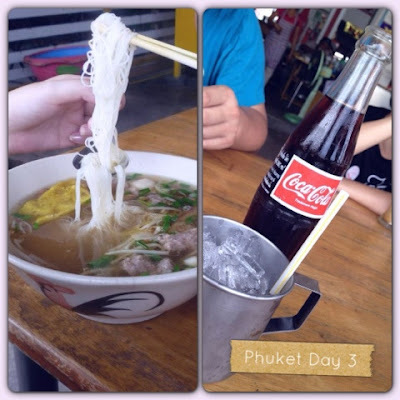 Our cheapest meal in Phuket! Later on, continuing our trip by hunting souvenirs. 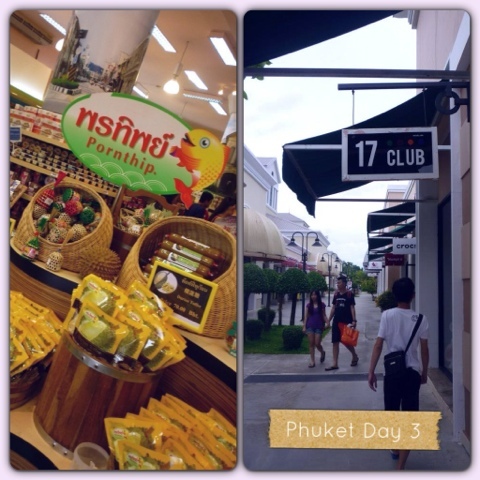 The nice tourguide brought us to some places that sells Phuket's delicacies and other cheaper souvenirs. Spotted this baby elephant. Some of us paid to feed the baby. 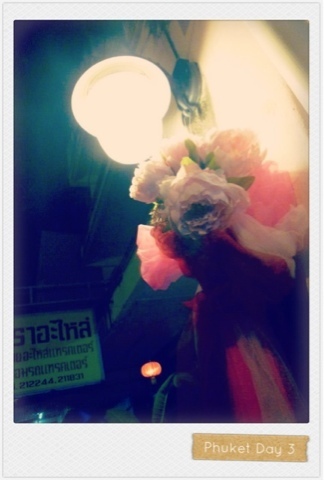 Then our night stop, Phuket Indy Market: opens every Thursday and Friday, from 4pm - 10pm. A youngsters hangout place where most of the teens sell their creativity products. Look at the Eeyore! It's handmade and it's way too cute! 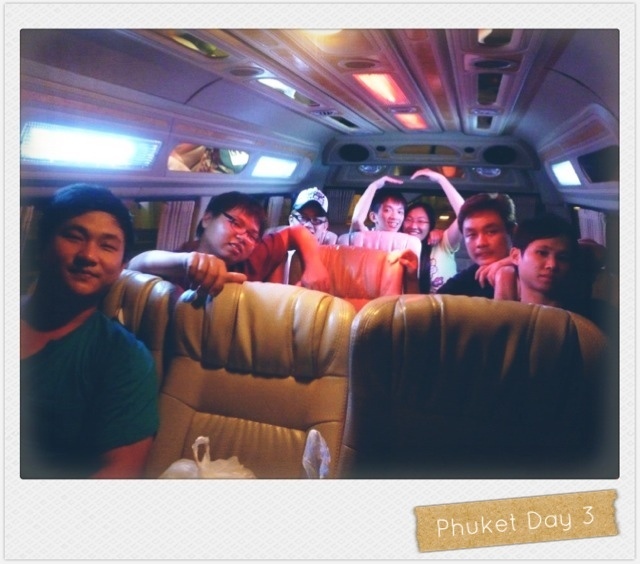 Our last stop: Phuket Town. Just walk around seeing all those old buildings. Like those old town, where most of the shops were all already closed in the night. Ended our trip with a group photo taken by the tourguide in the van. Look how spacious the van is to fit all of us in! 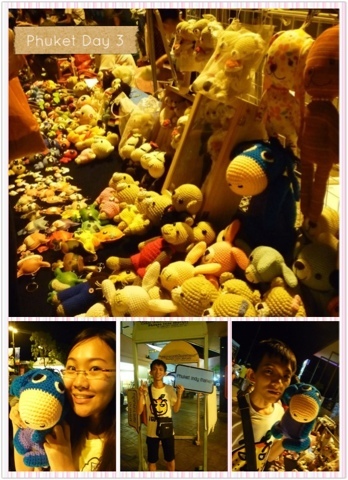 Souvenirs me & Fan Su bought! Spent our dinner back in the hotel. Free cocktail from the hotel! Thanks! That's all from me now. Few days more to Chinese New Year. I am in the CNY mood already! Haha! Cheers everyone. More updates soon.